Our Mission : Develop and empower medical sales professionals through live and virtual interactions to include medical sales training, consulting, medical sales keynote presentations, medical sales coaching and mentoring, books, video, and audio programs so the products and services they represent may enhance the health care provider’s ability to deliver care and improve the patient’s condition. Companies that sell to healthcare are losing control–control over pricing, control over regulatory and compliance issues, control over who they can sell to and who they can’t. Companies adapt to the things they can’t change. But do you know what doesn’t make sense to us? When companies don’t control the things that they can. Things like sales performance, for example. So we we burn up a few of our valuable customers…big deal! WE THINK IT IS A BIG DEAL! We want to change what most companies do in the area of medical sales training and product training. That is, they throw sales people into one end of the training process and hope that something good comes out the other end. They don’t control the training process all the way through to the result, and that makes no sense. 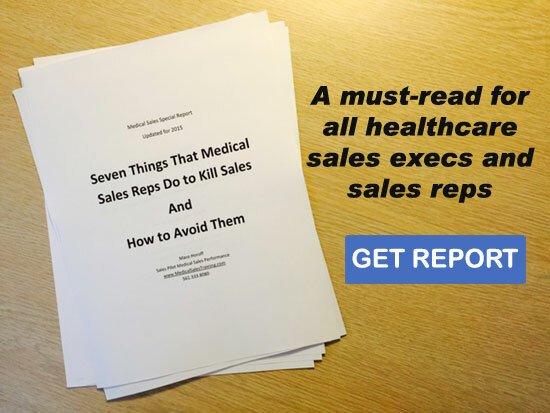 To your healthcare customers, your salespeople ARE your company and your products. We don’t think that this should be left to chance. There are ways to improve sales performance without sacrificing the confidence of your valuable customers. Your customers are experts. They take care of patients. If they have something less than supreme confidence in the sales rep and what he or she sells, they will move on to someone else. Their conscious, as well as their subconscious mind will choose another rep with another company. Would you fly on an airline if you were unsure of the outcome? Of course not. Would you fly on an airline that trained its pilots the way most healthcare companies train their sales reps? What if the airline provided its pilots with only “information” on how to fly? Would that be good enough? What if they did a little role-play to pretend how to fly in the real world, would that make you feel better? Can you imagine an airline just assuming that its pilots are safe and puts them in command of a $200 million aircraft with 300 people on board? Most people would think this is ludicrous! Give someone the keys to something worth millions of dollars where lives are at stake? We don’t think companies that sell to healthcare should do that either! Sales Pilot does what airlines do. We provide knowledge, teach skills sequentially, and then hone those skills and measure them in a simulated environment before letting medical salespeople “fly” for real. When you sell to buyers who hold patient’s lives in their hands, we don’t think you should leave training outcomes to chance. We believe in training to the desired outcome and then making sure that each sales representative is performing over time so you get what you paid for–a medical sales professional who hits or exceeds quota consistently. There are things you can control. It is Sales Pilot’s mission to work with each company and each salesperson to ensure that they have the skills and knowledge necessary to make a difference for their customers and their customers’ patients. We would love to tell you how it’s done and why it works. Contact Sales Pilot at 561.333.8080 or email us .